This jQuery plugin gives you very simple way to change your stylesheet theme. Brought to us by immortalwolf.com, this easily configurable addon to the already easy to use jQuery is a cinch. Even cooler, this plugin is tested for IE6+, Firefox, Safari, Chrome, Opera, and even Android and iPhones! First we add in our main stylesheet (seen below as styles.css) and then we load our theme file which can have different colors, fonts, layouts, or background images – whatever you want! And finally we put it to action! Here we tell the style switcher to load style sheets from the links presented in the div with id=”header”. The only thing to note here is that the id for each of the links relates to the name of the CSS file that the style switcher will locate. In other words, they must match. Once you have all the above in place, the style switcher takes care of the rest! It even shows a preview of the alternate CSS files when the links are hovered over. Jump to the demo or read on! 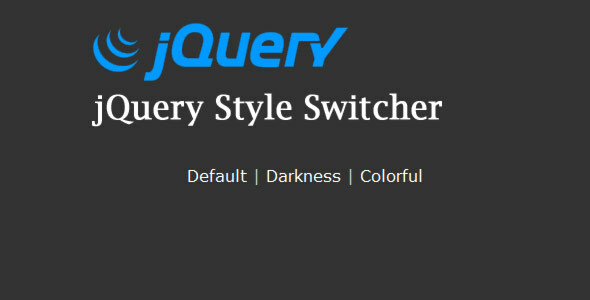 There are a handful of items to make the jQuery CSS style switcher work better for you! Make sure to include the trailing slash in the directory! 1/27/2011: Thanks to a comment from Redwan, we updated jQuery Style Sheet Switcher to include a cookie option that will save the user CSS choice and load it on each page change. We have updated the component with the modification! The jQuery Style Sheet Switcher plugin will automatically check the cookie and load the correct style sheet. You can use this option if you would prefer to have PHP or some other server-sided script handle the cookie on page load (this is recommended). And finally, if you would like to use this script without any cookies at all, you can simply turn off the feature completely (default is on – cookies enabled). Note that manageCookieLoad will be overridden by this setting, and any server-sided script will still load the cookie if it is on a client’s machine. 6/24/2011: In response to a comment from Jo, here is some sample code that will disable the preview on hover, disable the JS management of the cookie loading, and use PHP to load the correct stylesheet. For every additional stylesheet, you will need another block in the if statement (or you can use the PHP array technique that is described in detail here). Flash AS3 XML SlideShow with Preloader and Link Hot Spots Broken Bells sounds like Gorillaz. But that’s not a bad thing.